Boston, MA – With Roe v. Wade in jeopardy and reproductive freedom under attack at the federal level, Governor Charlie Baker today signed proactive legislation to decriminalize abortion and protect reproductive health care in Massachusetts. The bill, S.2260, overturns archaic pre-Roe Massachusetts statutes that date back as far as the 1800s, and underscores the importance of state leadership in protecting women’s access to care in the face of a hostile president, Congress and Supreme Court. Across the country, states are considering similar legislation to update their abortion laws and safeguard access to care should the Supreme Court further gut or even overturn Roe v. Wade. In New York, NIRH is advocating for the Reproductive Health Act (RHA), legislation that, like the bill passed in Massachusetts, would wipe outdated criminal abortion bans from the books; it would also enshrine abortion rights into state law. Rhode Island is considering similar legislation to decimalize abortion, and last year, Delaware repealed its pre-Roe abortion statutes and Illinois rescinded a rule that would have outlawed abortion if Roe is overturned. NARAL Pro-Choice Massachusetts is the leading grassroots pro-choice advocacy organization in the Commonwealth, and works to protect every woman’s right to access the full range of reproductive health options, including preventing unintended pregnancy, bearing healthy children, and choosing legal abortion. NARAL Pro-Choice Massachusetts is the state affiliate of NARAL Pro-Choice America. 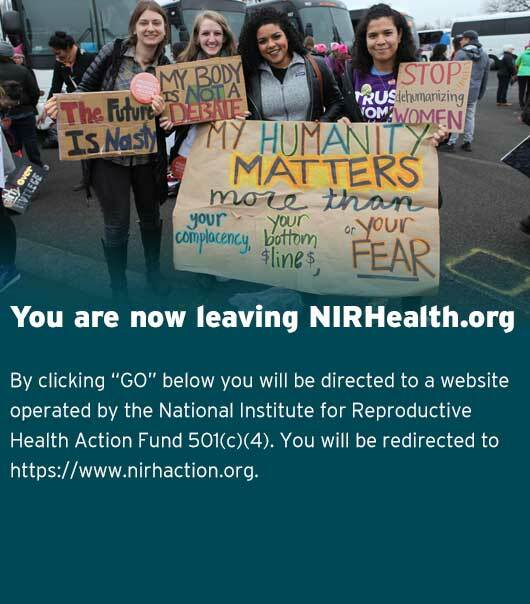 The National Institute for Reproductive Health (NIRH) builds power at the state and local levels to change public policy, galvanize public support, and normalize women’s decisions about abortion and contraception. Using a partnership model, NIRH provides state and local advocates with strategic guidance, hands-on support, and funding to create national change from the ground up. In 2018, NIRH is working with state and local advocates to advance reproductive freedom in 23 states; to date, NIRH has partnered with more than 150 reproductive health, rights, and justice organizations in 39 states and 56 localities across the country.